You can't go to Xinjiang without eating lamb. Lamb kebabs, lamb dumplings, lamb with noodles and whole roasted lamb. We had a chance to have the whole roasted lamb in a dish called shou zhua gua yang or literally "hand shredded lamb" at a restaurant in Dunhuang before we watched the show about the Mogao Grottoes. Like every other restaurant we ate at during our tour, they were catered to tour groups and this one was not exception. 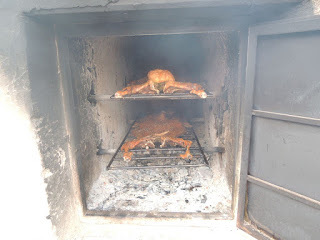 At the entrance to the restaurant were brick ovens powered with white hot charcoal where they had really young lambs that were spread as flat as possible onto racks and then roasted. They were slow roasted for about two hours so that in the end the skin was very crispy, most of the fat had melted and the meat very tender. Apparently there is a ritual around cutting the lamb -- where the eldest at the table is given the knife to make the first cut. My uncle was given the knife and he stabbed the lamb... as if it needed to be killed -- again. 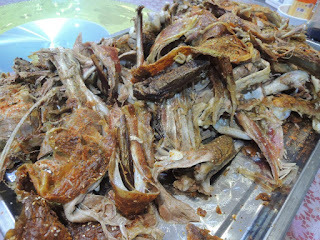 Afterwards the lamb is shredded for consumption. Dig in! The lamb was then taken back to the kitchen and soon afterwards it reappeared on our table completely ripped up into chunks and bits. Each of us were given a thin plastic disposable glove to grab the meat and dip it into a choice of a few sauces, but really it was fine on its own. The meat was very tender, particularly those near the bone. Some of us licked the bones clean too. 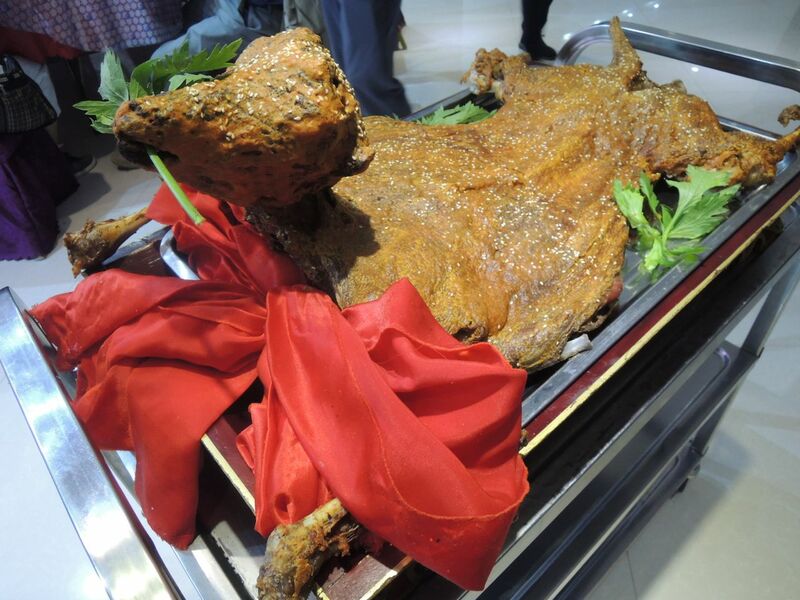 This lamb dish was accompanied by mostly vegetable dishes, like pickled radishes, mung bean jelly, cucumbers with garlic and fried vegetables.